Physical Sciences Librarian and Interim Head of the Science & Technology Library at the University of Akron. So on July 23rd, the 2012-13 first year academic experience bloggers got this from blogging dynamo Maura Smale, “If you’d like to write a summing up post sometime this summer, that would be great –” . This was good news; I did want to summarize my experiences for new librarians before the school year. I had the mental outline of a post and then came my first retention narrative (warning, sound). I thought at that point it would be easy to do what I had been doing the first year – knock out a blog post over a few slow info shifts. How very much things have changed. Last year set the stage for a much, much busier second year. My outreach efforts generated many, many more instruction sessions. – all of which had to be prepared from scratch. My service duties had also ballooned – I’m now on two university committees, and have completed two faculty searches. Finally, I’m gearing up to turn my research into research products. In other words what I thought was a deep end introduction to my job turned out to be relatively easy in retrospect. Failing in the “Summer” part of the request, and having rewritten this a couple times, my take home from the first year is that my liaison work gave my subject departments the confidence to gift me with a success problem. I didn’t expect the workload of this semester, but I had some wise advice about setting boundaries and sticking to them early that has made this year manageable. I told people early I couldn’t do document delivery, much to the lament of six departments worth of graduate students. But if I scanned articles regularly, I wouldn’t have time to plan a gallery opening or perhaps hatch an open access initiative – activities which should benefit Akron more in the long run. So meet everyone, make connections, and be persistent. Not everyone appreciates my “just barge in on them” method of liaison librarianship but most do and it is effective, especially for the lab sciences where you should have no expectation of ever seeing a faculty member in the library. If my first year on the tenure track is at all typical your work week and your home life will become increasingly blurred… he typed during his holiday vacation. As a physical science librarian I know journals are the primary form of scholarly communication in the sciences. 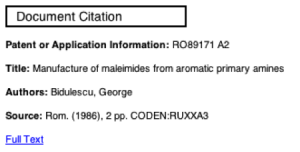 While the particle physicists have arXiv and some of the cool-kids will tout non-traditional knowledge transfer though social media, my chemists use journals and are pretty comfortable with that. Of course, electronic journals are greatly preferred – it’s easy to print and you can grab articles off the web and file them away for the rest of your career. No photocopying or waiting – and your graduate students can practically live in the lab. This shouldn’t be news to any academic librarian (really, it shouldn’t be). But what might be news is the same scientists are not nearly as interested in ebooks. Ebooks take a text, put it online and allow scientists to access the information utilizing an Internet browser. So why have I had users asking me to purchase physical copies of ebooks in our collection? Some of the problem is platform – by which I mean Ebrary. Most scientists don’t read articles online; they download them, print them, and then read. Most of the science monographs I purchase are edited works on a topic and each chapter is, effectively, like a journal article in terms of length and topic coverage. Ebrary presents the electronic text as a book and only allows users to download 60 pages as a PDF. This is a problem if you want a large review article or more than one chapter; then the ebook is suddenly less useful then a print book, because you can’t even copy it. When I polled my faculty earlier this year, some said they always prefer ebooks. But among those who conditionally preferred an ebook, all of them preferred chapters arranged as PDFs with unlimited downloads. The actual ebook – an electronic text meant to be viewed only on a screen – has very little support. So Ebrary is the main option I have for purchasing ebooks, but my patrons like Ebrary’s model the least. Another platform problem is viewing platform; not everyone has a dedicated electronic reader to make ebooks pleasant and even if you have one, it may be a hassle to view. Ebrary for Kindles and iPads require additional software, but hey – it’s only a 14-16 step process. Without a tablet of some sort, you’re stuck with a laptop screen that cannot comfortably view a whole page at once or a desktop monitor that may be ill suited to reading. My real issue with the variety of experience ebooks provide is it makes your collection decisions inherently classist – your patrons with the wealth to afford a nice tablet have a better experience than your less privileged patrons. Print books have downsides, but using them doesn’t inherently reinforce inequality. So as beloved as electronic journal are, I just cannot say the same for the ebook. And until the vendor platform offers ebooks my patrons want, I can’t say I’ll be buying many. This is the lowest hanging fruit among my reference requests – click the “Full Text” link, another click to Espacenet, download the full-text, send to graduate student, log the transaction. Read to finish time – under two minutes. But Espacenet, had a grey font where the “Original document” link resides – the original was not available. Well, that’s sad, but hey – I’m a professional librarian. I found and searched the Romanian patent agency. I also tried the Derwent Patent Index (through Thomson Reuters for us) and Google Patents – I got an abstract from Derwent, but no full text. So I invoked the nuclear option – an open question on the Chemical Information Sources Discussion List. This invaluable treasure has taught me well, and I once answered a query off list. But there was some trepidation about asking such a learned cadre of science librarians because, frankly, there might be some easy answer I missed which would make me feel dumb. But I decided this was the best-case scenario because I would learn something; so I asked the group mind. The Intellogist patent coverage map yielded no full text options. Chemical Abstacts unfortunately no longer does document delivery; but they looked anyway and could not find it. The patent has only been cited by Cytec Industries and their intellectual property department could not find it in their system (but hey – corporate citizenship, good job). I contacted the USPTO Science and Technical Information Center; they looked in their warehouse, but could not locate the patent. I also tried searching for the inventors (nope) and also sent a machine-translated email to the original Romanian assignee. There are few remaining options – a document delivery service like FIZ AutoDoc or ordering the patent file wrapper of the citing U.S. patent, (RO89171 might be included in the original filing materials). But these services are relatively expensive compared to what we will generally pay, so I would have to kick it back to the user – which feels like defeat. Yes, I have anthropomorphized a reference request into my nemesis. This is really the first time I’m staring down a patent retrieval defeat – and it’s chafing a little. But in terms of my duties, I have a collection to analyze, my first convention coming up (cough, cough), and the metastasizing committee responsibilities inherent to the tenure track. Among other things (like the cold call that just eroded 5 minutes of productivity). I don’t think I’m going to “win” this one and I’ve probably spent too much time on it already. 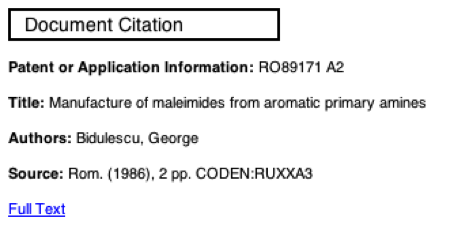 So if you ever need something ungoogleable for a demonstration, trot out Romanian patent 89171 – at least until someone gets around to scanning it. One aspect of being a new librarian is the feeling of having arrived late to a party where everyone is already deep in conversation. You lurk with your drink and canapés hoping to hear something that resonates on which you can say something intelligent. Or perhaps you just blurt out what you’re thinking to the delight or horror of your new peers. So I hear things about 3-D printers and think I have something to add. My gig before science librarian was equipment manager for a Cell & Developmental Biology department. So I have some years of experience evaluating, purchasing and subsequently training people on highly technical equipment. The value of centrally funded equipment is fairly clear to me, and you can see cool examples of how a 3-D printer might save money in lab. But this single blog post gets trotted out too frequently as a justification for 3-D printers. There’s been some pushback on 3-D printers – Hugh Rundle and Jacob Berg both come to mind. And they make good points – like you may have way more important things to do with your time, or maybe the main library isn’t the best place for these things. But they also reference “technolust” (Rundle) and “wish fulfillment” (Berg) as a dig at the motivations for getting a 3-D printer. Fair enough, but I think a library is a pretty good place for these things if they are coming to your campus, unfortunately you probably don’t have the time to make them really useful. Most lab equipment is poorly utilized. Very few pieces of equipment get used daily in a lab, – pH meter, spectrophotometer, benchtop centrifuges, and thermocyclers (perhaps) all get regular use. But there probably isn’t enough demand for a single lab or most departments to own a 3-D printer and use it to capacity. In the cost saving link above, the author made some electrophoresis combs – that can probably be used for years. I’ve closed out a lot of labs, and there are multitudinous gel combs and molds floating around, you’re just not going to be cranking them out daily. Having access to a 3-D printer is a potentially huge benefit to scientists trying to replace a small plastic bit of a machine (cost $50-75 from manufacturer) or to engineering students working on something like a robotics project. However, not many lab groups would be using them daily, so sticking them at the individual lab seems like a waste. Even if an individual lab can justify the time and space, individual labs are often terrible, and I mean truly awful, at sharing. Dispositions run the gamut, but my memories of negotiating for access to a piece of equipment reminds me of baksheesh. Having a place where scholars can go, get training, and not get entangled by reciprocity has a lot of time saving value. The grapevine is also a poor way to inform a community of new technology. Scientists (and I imagine other scholars) like to see things in action before purchase. Scientists generally ask their peers and poke around before purchase, so getting a 3-D printer could also serve as a proof of concept to the community. Most will probably conclude they don’t need one for themselves. But the thing about 3-D printers is labs are only the most obvious users, and if a printer is put there they will most likely be the only users. Off the top of my head, 3-D printers have applications for art, education, and archaeology in addition to STEM fields. All that said, I’m a bit leery of bringing 3-D printers into the library because they squirt hot polymer compound through tiny holes. Entropy is a tremendous enemy of devices like this and I fear they would be rapidly beaten into uselessness in a shared use environment. I’m sure they are well engineered and easy to clean (down sales reps, down) but … hot plastic, tiny tubes. Also, even if they are plug and play, designing something cool must take some training – and who provides that time and expertise? That said, I’ll leave folks with some nuts and bolts questions to help them assess whether a 3-D printer is right for their library. How much is a service contract for this machine? If I don’t buy a contract, what are the hourly service rate, the travel allowance and per diem cost for a technician to visit? Alternately, do we send it in for repair? If so, what are the packing requirements and typical turnaround time? What is the consumable cost? How much time does it take to switch consumables (for example – plastic colors) and does that take special training? Do I have to purchase consumables from you or are there third party solutions? Consumables also include things like motors and belts – over time every moving part is a consumable. What routine maintenance is required? How long does cleaning take and how often must it be performed? What operating systems do you support? Do we get free updates to the software? How about the firmware? Do we get free upgrades to the software? Can you import schematics from other programs? What circumstances void the warranty and/or contract? Any good rep should have this info off the top of their head or very quickly. 3-D printers are cool and relatively inexpensive. Given the range of applications, a library is a pretty good fit. But the time and energy they may require for user training and maintenance should be investigated pretty thoroughly before purchase.